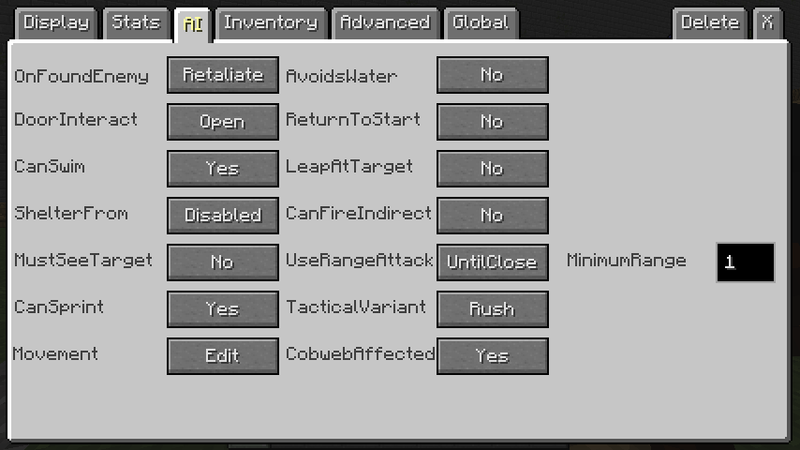 [1.7.10] Any way to make NPCs chase the target while using range attack? I created NPC and made it use range attack with the setup like the pic that I attached to this topic. The problem is when it's using range attack, it shoot the target while stand still all the time. It doesn't make any move until the target get away too far from its aggro range. I tried changing 'MustSeeTarget' option to yes but it get even worse. The NPC try to chase the target but it walk very very slowly and didn't shot even the target stand in its attack range. It will shoot the target only when it get very very close to the target even I set its aggro range and attack range to 64. I also tried changing its tactical variants but no one of them work fine. The only thing I want is just to make the NPC chase the target while shooting... Any solution here? well as of my case, ive posted issues and questions regarding 1.7.10 of this mod, the only answer i get, 1.7.10 or old versions are not supported anymore on this forum. I dont even know where to ask questions about old versions that I think still too many people are using. I hope they will still provide old forum in that case. Sorry for my english.